How to book Cheapest Train Ticket Online, Indian Railway Ticket Bokooking Offer– Hello friends, Hope you all are fine and Enjoying Our Free Tricks To recharge, shopping loots and deals. Tody’s deal is about save money on Ticket Booking. 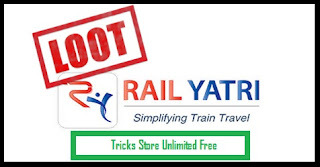 And The New website called Railyatri Offers huge discount on train ticket booking. Now Railyatri is offering Flat Rs 400 discount on train tickets bookings. RailYatri Booking Offer, To avail this High discount offer, You needs to book Your train tickets between the period of 1st August to 31st August 2017 through Railyatri website or App. And You Can Also grab the offer by Phonpe where you will get extra Rs 100 Cashback on paying with the Phonepe wallet. Railyatri is Now India’s leading online travel site which provides Online Booking Services like- Bus ticket booking, train ticket booking, meals on train & many more services. Friends just Book your train ticket with Railyatri.in website/app and make the payment through your phonepe wallet and get the 10% extra cashback on your train ticket booking. The maximum cashback you will receive is amount of Rs 100/user. And The cashback will be Deposited into the your Phonepe wallet after PNR Generation. 2. Click on “Train Tickets Booking“. 3. Select your journey stations & date and more details. 4. Enter your Mobile number. 5. Tap on “Get Token to Call Agent“. 6. Finally You will receive a token on your mobile number. 7. Now call the agent number which you received in the message. 8. Tell him about your train number & your passenger(s) details. 9. Make Your payment on given link which is provided by the Railyatri agents. It’s done your train ticket booking is successful. * Use the Coupon code “TRAIN400″ during train tickets booking. * The Promo code is valid on the train tickets bookings between 1st August to 31st August 2017. * The customer has to book the tickets through Railyatri App or website. * Maximum discount amount per train ticket is Rs 300 + Rs 100 Cashback. * The Promo code can be redeemed one time/user. * 10% cashback with the Phonepe wallet. * No minimum train ticket amount is required to grab this offer. * The customers will get the 15% discount on their ticket. So friends, For checking any railways status IRCTC is an official site in which you can also check your train ticket status. For checking your pnr status and railway ticket inquiry you can also visit IRCTC.com website or app. If you want an information about train ticket seats inquiry, seats reservation, ticket confirmation. Labels – Train Ticket Booking Offer, Flat Rs 400 Off On Train Tickets, Railyatri Train Ticket Offer.